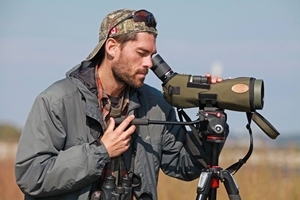 On Monday, October 29th, while browsing Windy.com and Tropicaltidbits, I decided that it’d be a good idea to head to the south shore of Prince Edward County in search of “Big Game” birds; i.e. fall rarities. Please see below for a short summary of my outing, along with my species’ checklists for each stop. Simply click the birding site title to access my eBird Checklists. I birded my way down to Adolphustown, where I then caught the Glenora Ferry over to PEC. I stopped at Finkle’s Shoreline Park along with Upper Gap in Bath. Once in the County, I birded along various County roads en route to Picton Marina. I then made my way to Sandbanks Provincial Park — Outlet Beach/East Lake, where I enjoyed excellent birding. I drove along many nice roads while in the County. I particularly liked Kings Road, where I observed two Northern Harriers, a Rough-legged Hawk, a flock of Eastern Bluebirds and a Vesper Sparrow. Next up, I birded Point Petre. Point Petre feels like Pelee; a rarity lurking in every tree…or in the grasses…or flying overhead. I felt my adrenaline kick in while I slowly birded some promising areas (sunlit, low wind, a lot of flying insect activity). 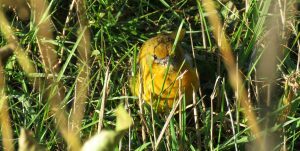 I managed to find a very rare bird while there — an October 30th Baltimore Oriole! After Point Petre, I birded from the roadside here and there as I made my way north, to Napanee, where I stayed for the night. A great first day with a lot of excitement! I made my way back to Point Petre, leaving my hotel room just after 7:00 AM. The wind was a-howlin’ on Wednesday, with gusts up to 60 km/h out of the S. Bands of rain were passing over the County all day…I was certainly going to feel alive! I decided on a stationary Lakewatch from the cement pier behind the lighthouse…and am I ever glad I did. Real crappy, binocular-and-scope-fogging, bone-chilling weather…but UNbelievable views of waterbirds as they passed by close to the cement lookout. The S winds were pushing them quite close to shore. 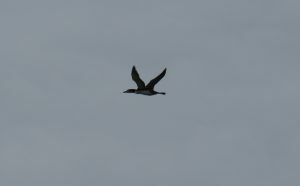 Eventually, my treat of the whole birding trip came in the form of a Pacific Loon, which passed by within 400 meters of my vantage point. This species is a great rarity in Eastern Ontario. 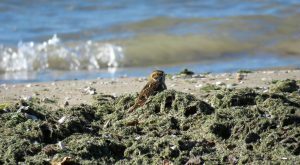 Though the likelihood of finding one is very low, it is most likely to be spotted from the Lake ON (Kingston to PEC) shoreline between mid-October and mid-November. Upon leaving Point Petre, I observed a migrant flock of 26 Eastern Bluebirds in a single field. I continued on my way and headed to Outlet Beach/East Lake to have a look at what the S winds brought to shore (hoping for a Red Phalarope!) but in the end, it was the same ol’ mix! I decided to call it a day and head to Black River Cheese, where I spent a cool $65.00 on cheese and maple products! What a great trip. Spare me your invite to Cuba, India, Bolivia, Costa Rica, Panama….and provide me with an opportunity to enjoy some simple comforts and excellent local birding and I’ll be your loyal friend for life! Photo: Cassin’s/Blue-headed Vireo, i.e. “Solitary” Vireo. 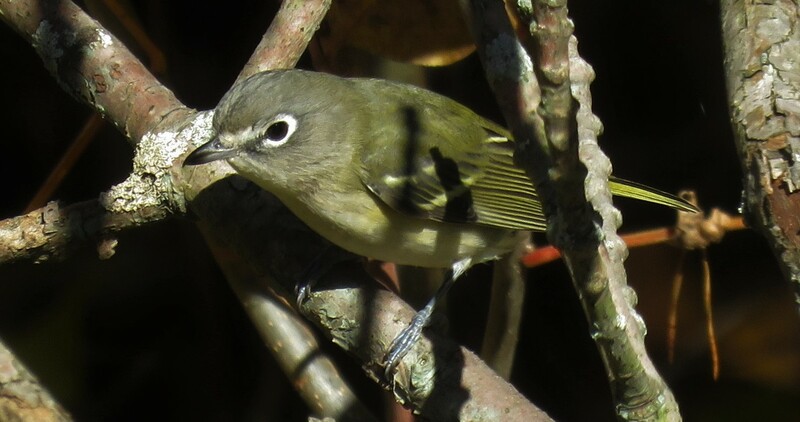 I’m still receiving feedback on this bird, but it’s looking like “Solitary” Vireo is the safest call (although it is most likely a dull first winter Blue-headed Vireo by location). For further details, be sure to see the October 30th eBird Checklist for this location, above. Sandbanks Provincial Park, Outlet Beach. 30 October 2018. Photo: “Hey, that’s where I suntan! !” This Lapland Longspur knows a good spot when it sees one. The gunk isn’t usually there in August! 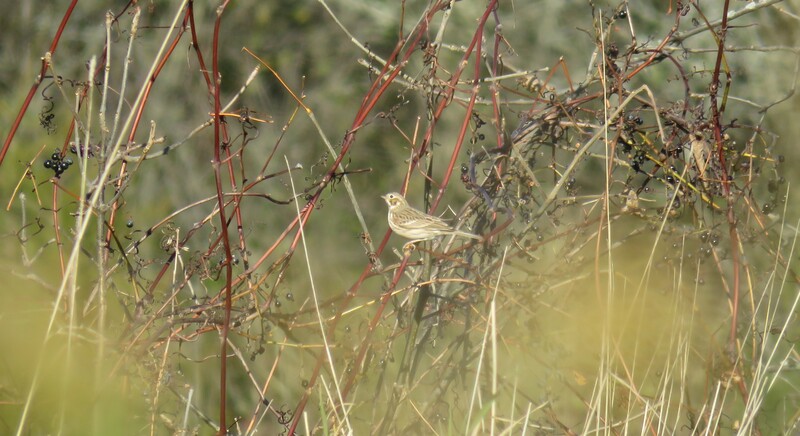 Photo: A lateish Vesper Sparrow along Kings Road. Photo: A very over-exposed photo of a lateish Orange-crowned Warbler at Sandbanks Park. 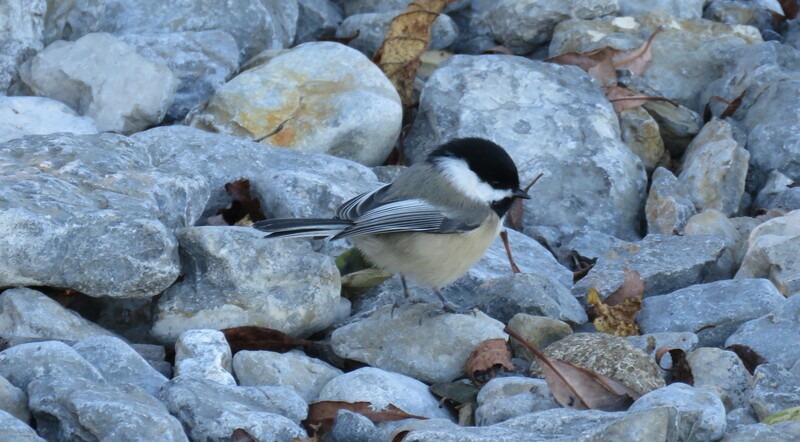 Photo: A Black-capped Chickadee clambers over rocks as it forages for food at Point Petre. I saw many chickadees while birding The County. 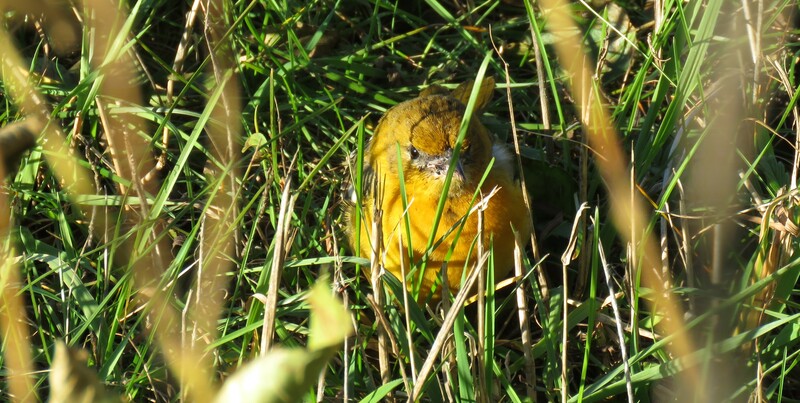 Photo: A very rare Baltimore Oriole in the grass at Point Petre. 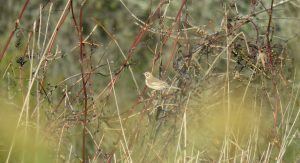 When I found this bird, I was working the scrub along a fenceline at Petre, where the sun was shining and the cool wind was low. 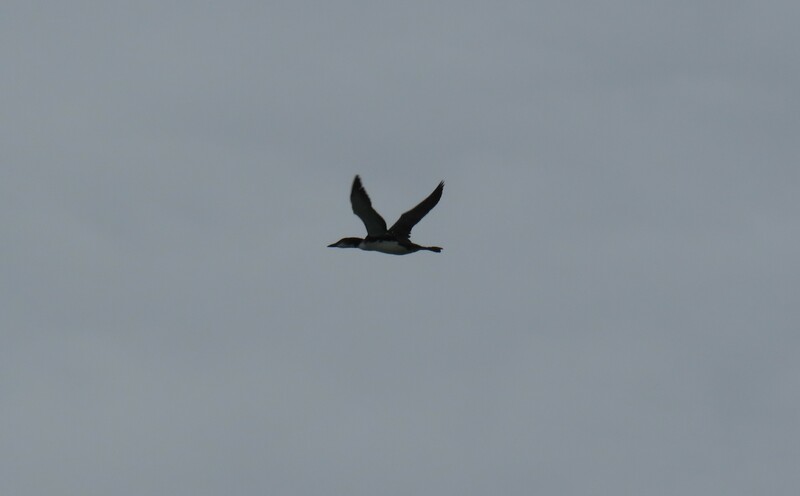 Photo: A Common Loon passes by at Point Petre. Photos: With such good birding, all-around, I wondered if I’d get a cherry on top. Well, I did. Pacific Loon!